The treasurer role can be a difficult position to fill. The good news is you don’t need to find someone with a financial or accounting background to be treasurer! We created this Treasurer’s Toolkit specifically for PTO and PTA leaders who don’t necessarily have experience handling budgets, bank accounts, and reports. We’ll walk you through all the key financial steps of parent groups and everything you need to handle your parent group money correctly and keep accurate financial records. The toolkit includes tips on smart budgeting, instructions on how to create a treasurer’s report, a checklist of important monthly tasks, ready-to-use financial forms, customizable worksheets, and lots of other helpful tools and information. Did you know that PTO Today Plus members get all our toolkits as part of their membership? 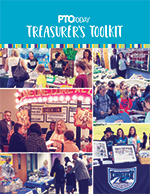 If you’re a Plus member, you can download the complete Treasurer’s Toolkit right now. To learn more about Plus and all the benefits of membership, including access to all eight of our expert guides (retail value $332), visit PTOtoday.com/plus. After your purchase is complete, you’ll receive instructions on how to download the toolkit.